A new study finds that the age of individual pumas near Jackson, Wyoming, had the greatest influence over the prey they chose to hunt. Older mountain lions went after elk, among the largest prey species in the study area, while the younger cats hunted small animals like raccoons as well as mule deer. The research calls into question the validity of recent wildlife management plans in the western United States to grow mule deer populations by culling mountain lions, the authors say. The puma family took biologist Mark Elbroch by surprise. They were supposed to be a ways off. But here they were, year-old kittens, bungling the final moments of a baby mule deer’s life in a matted-down circle of grass as the mother mountain lion looked on. Elbroch, the puma program director for Panthera, saw a rare opportunity to capture on film what biologists call “operant learning.” So he set up the remote cameras he had in his backpack, and he waded back into the hip-high grass of western Wyoming and out of sight. They still hadn’t dispatched the screaming fawn when the kittens dragged it off camera. “It’s horrific to watch,” Elbroch said. A camera trap photograph of a mountain lion in California. Image by Sebastian Kennerknecht. It turns out that, as pumas learn to hunt throughout their lifetimes — even long after they’ve left their mothers’ sides — it affects their choice of prey. This discovery, reported March 29 in the journal Conservation Science and Practice, potentially calls into question the assumption that allowing hunters to kill more pumas (Puma concolor) will translate into more of the elk (Cervus elaphus nelsoni) and mule deer (Odocoileus hemionus) that human hunters prize. This assumption has led to recent decisions to increase hunting of mountain lions in the western United States. “As pumas get older, they tend to select larger prey,” he said. And the reason for that is equally straightforward. A graph shows that older pumas hunt larger prey species. Image by Panthera. Young cougars typically go after small prey like hares, raccoons and grouse. With age, they graduate to killing mule deer and then to specializing on elk, the most common preference among the cats in the study and the one favored by the oldest animals. Those results suggest that recent moves to increase the numbers of sought-after trophy species of herbivores like mule deer might be ill-advised and counterproductive. Colorado Parks and Wildlife, the state’s game agency, has embraced a “predator control” strategy involving the hunting and trapping of up to 15 pumas and 25 black bears (Ursus americanus) a year with the goal of boosting a flagging mule deer population in the state’s northwest corner. 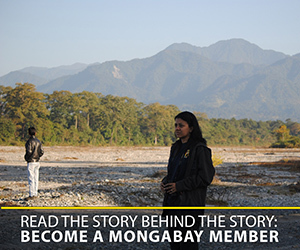 The deer’s meat and the males’ antlers make it a favorite quarry of hunters, and Panthera said pressure from hunting groups helped set this plan in motion. But earlier research in Idaho demonstrated that taking pumas (and coyotes) out of the equation didn’t help local mule deer populations grow, even though more females and fawns survived. Another study revealed a correlation between sustained puma hunting and a younger puma population, as hunters seek out and kill the oldest and largest cats. 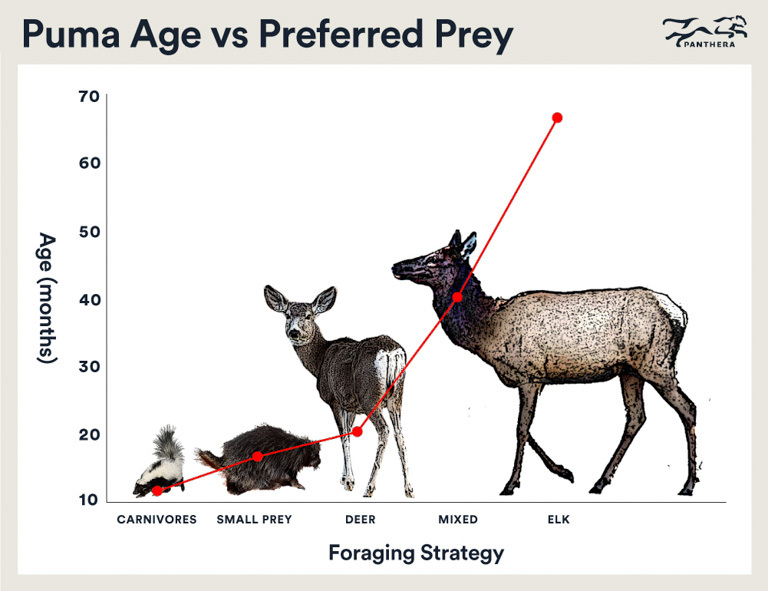 The upshot of that finding, taken together with this new study, is that killing more pumas might actually increase the proportion of the population that specializes in mule deer, which are smaller and easier to bring down than elk, Elbroch said. 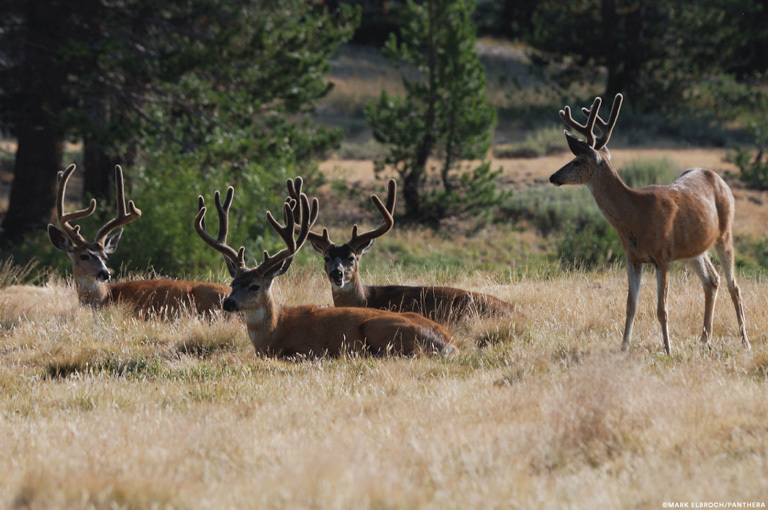 A group of male mule deer. Image by Mark Elbroch/Panthera. “The conclusion that unintended consequences are possible is a really important one,” Kyle Knopff, a wildlife biologist with Golder Associates in Calgary, Alberta, said in an interview. Knopff, who was not involved in this study, noted that 13 animals was a small sample size that made it difficult to draw more specific conclusions, and agreed with Elbroch’s view that the results warranted further testing with more mountain lions over longer time periods. Knopff also noted the “incredible amount of effort” that such research would entail. In 2010, Knopff, then at the University of Alberta, and his colleagues published a study in The Journal of Wildlife Management that examined the prey selection of more than 50 pumas in Alberta. Among their most significant findings was the notion that individual puma prey preferences varied, with male pumas, which are much bigger than females, going after large game like moose (Alces alces). But, Knopff added, more research is needed to confidently say that puma hunting will or will not increase populations of ungulates, the hoofed mammals that include elk, deer and bighorn sheep. Game agencies often favor controlling predator numbers as a way to increase the number of deer and elk on the landscape, but this research suggests that this strategy may not work. Image by Mark Elbroch/Panthera. “In my view, the actual scientific conclusion is that we need to be very careful how and under which circumstances we harvest predators if our intentions around predator management are to have some certain outcome for ungulate populations,” Knopff said. “The take-home message here is that it does matter what animals you remove from the population,” John Laundré, a cougar biologist at Western Oregon University, said in an interview. Laundré said Elbroch’s study supported what researchers have been saying about predator-prey relationships for decades. 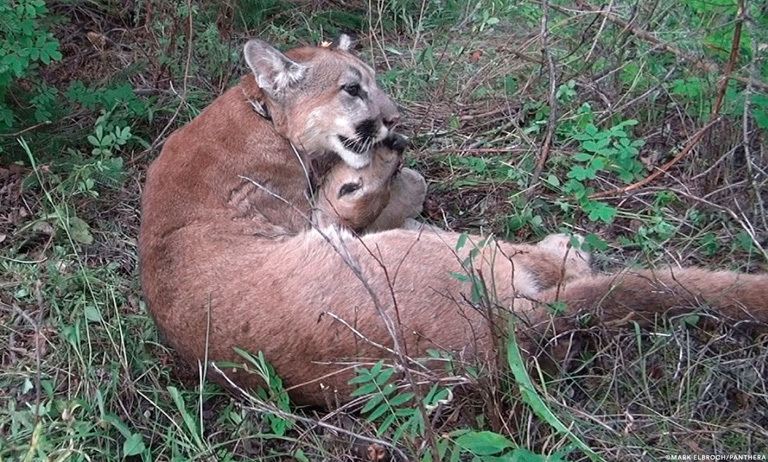 A puma eating a mule deer fawn. Image by Mark Elbroch/Panthera. In a recent study, Elbroch and his team made the case that mountain lions are “ecosystem engineers” because the carcasses they leave behind provide food and habitat for a wide range of other creatures. 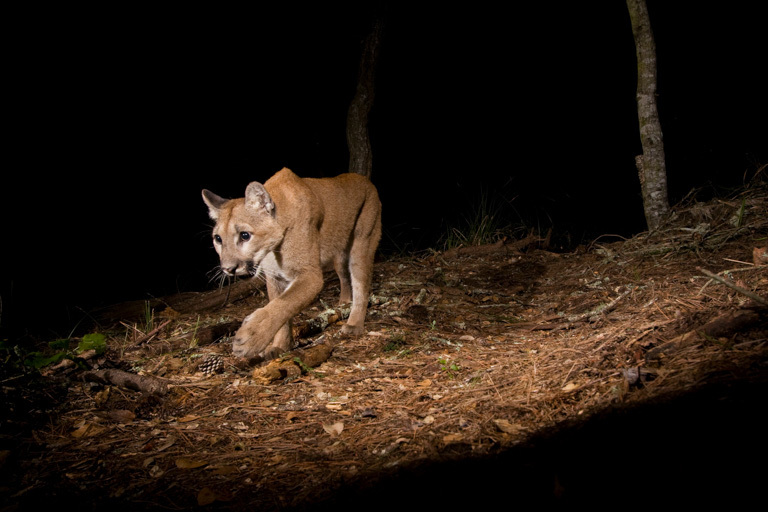 The researchers found 215 species of beetles in prey animals killed by mountain lions. While current management strategies ensure that cougars persist in the West, these approaches don’t account for the “unintentional effects” of hunting, Elbroch said. 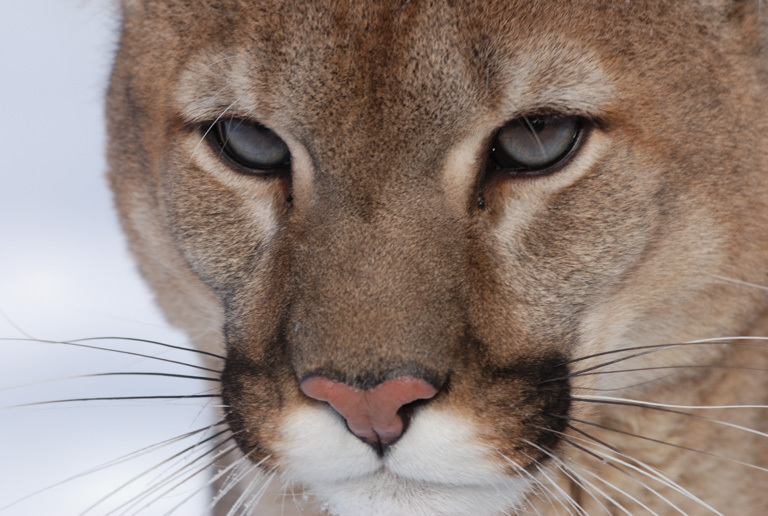 In his view, that calls for a “move away from the numerical assessment” of mountain lions. Banner image of a puma by Mark Elbroch/Panthera.